Not so long ago, the drive to church was a noisy affair. The car was jam-packed with family, and we were usually running late. But today I would be arriving early and alone. As I drove, mental post-it notes whirled through my mind, and I felt a little anxious. I’d worked on this map project steadily for a month: compared gospel accounts, read articles, scrutinized atlases, pestered my well-traveled friends with questions about Jerusalem and the outlying areas, all to visualize Jesus’s wanderings during the last week of His life. The idea was to examine His steps for that week- to study the trips to and from Bethany; to understand the escalating conflict with the religious establishment; to feel the ominous presence of the Roman military. I wanted the children to understand that Jesus didn’t show up one fine day and offer to die that afternoon. Although that would have been a staggering gift of love, what He did was so much more. He set His mind to save us, and steadfastly walked, day after day, toward the cross. Loaded into the back of my car were many of the props for the project: 30 lbs. of clay, 40 pizza bases, 320 tiny banners and 320 toothpicks to mount them on, 40 tiny wooden crosses, 40 blank calendars; the list went on and on. Had I forgotten something? Would the kids be bored stiff? What if they didn’t learn anything? Wait- was this idea just dumb? Abruptly, memory invaded my anxious thoughts. I was in the car with Jon, heading for Kettering Hospital and his first cat-scan- a surreal errand to run on Easter morning. We found the waiting room empty except for the receptionist at her station. As he signed in, Jon smiled and gave the traditional Easter greeting, “Jesus is risen!”. The receptionist stared briefly and told him it’d be a few minutes. He tried it again on the cat-scan technician. “Jesus is risen!”, he called out. She smiled uncertainly, and proceeded with the scan, but when the scan was done, she said, “I get it. It’s an Easter thing”. Jon and I were to discover that it was more of a “survival” thing- a three word manual on joy. Joy is generally defined in terms of emotion: delight, happiness, exultation, euphoria, etc. But the writers of the New Testament had an irritating habit of commanding Christians to “rejoice always”. Feel happy when you’re being persecuted? Delight in diaspora? Not likely. Obviously, in their minds, joy was made from a different material. What’s more, it was constantly accessible to those who knew where to look for it. So what were they always rejoicing about? They were rejoicing in that “Easter thing”. They were rejoicing in a resurrected Savior. I often find myself hedged in between darkness and light. Three years ago, it was cancer on one side and “Jesus is risen!” on the other. Today, I was wedged between self-doubt and hope. Then I saw it. How ridiculous I was being, obsessing over little clay models of Jerusalem, and forgetting the message that gave value to the project! At once, anxiety evaporated, and laughter took its place. Sunday’s lesson would be just fine- whatever I forgot or didn’t forget. Monday was bright and warm, and as I walked the dog, I saw a towhee singing on a sycamore branch. It was quite a display: he was proclaiming his territory, trying to entice a female to join him. Twenty-four hours later, the temperature had dropped 50 degrees. As I waited, shivering, for Dugan to do his business, I heard a bird singing above me. It was that towhee- singing on a snowy branch. The weather hadn’t changed him. He was created to sing in spring, and he was determined to sing- no matter if the day was sunny or snowy. What a blessing this was! Sending it to all our kids. He is Risen! Your word paintings never cease to encourage me! Jon’s words on that Easter morning make me realize that this truly is what it’s all about. Hope, not in our efforts to do our best, but that He gave His best for us so that there could be hope. 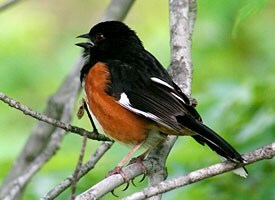 And the towhee! What a picture of perseverance and joy. Thanks for the humbling insights and word pictures.